There are not too many more picturesque locations on a sunny day than the Phillip Island Grand Prix circuit. In terms of Motor Racing venues it rates up there highly amongst drivers and riders for any circuit around the world. 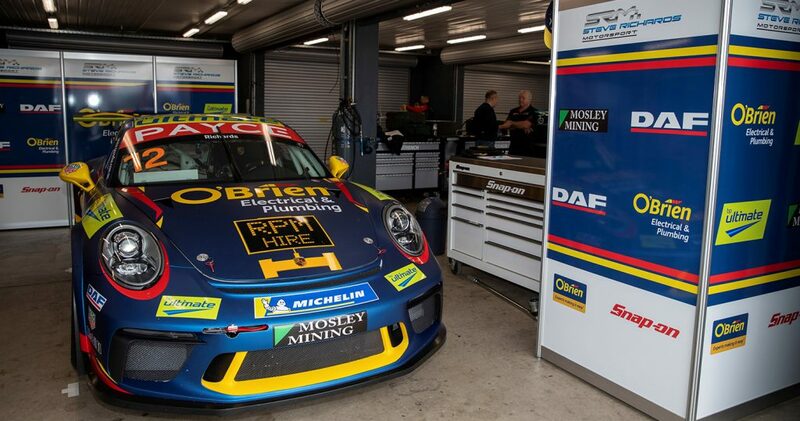 Phillip Island hosted round 4 of the Supercars Championship and Round 3 of the Porsche PAYCE Carrera Cup Championship Series for 2019. Its been a busy few weeks since our last event at the Melbourne Grand Prix. We’ve had ‘Brien’ apart and placed back on the Porsche chassis jig to check his compliance, attended the DAF Trucks annual sales conference where ‘Brien’ was front and centre during an evening event where I challenged the delegates to one on one simulator racing, a test day down at Phillip Island and a fundraising dinner with Mosley Mining supporting Rural Minds (https://www.rrmh.com.au/programs/rural-minds/) We helped to raised $17,000 by donating a ‘Hot Lap’ ride in Brien and a signed 2018 Bathurst winning race team shirt. The weekend race format was practice and qualifying on Friday, followed by two races on Saturday and the final race on Sunday. Friday was busy with 2 practice sessions and qualifying. There wasn’t a great deal of time to blink and the O’Brien Racing crew were kept busy throughout the day. Qualifying was pretty intense and we qualified 13th. Not what we were hoping. We did find an issue with the cars suspension settings which made some sense as to why we were so far down the order. Saturday dawned a little damp, but conditions improved quickly and with no rain forecast for the remainder of the weekend, no wet weather tyres would be required. Race 1 was the first of the Championship within our Championship. The Porsche PAYCE Carrera Cup Championship has an endurance style component to it where one of the races during the weekend is extended to 45 mins and comprises a separate Endurance Championship component, presented as a separate prize at the end of season awards dinner. We started the race in 13th, made a very good start gaining 2 positions. The jostling for positions in the early laps was frantic and we got pushed wide and dropped back to 12th position. After 45 minutes of racing we settled back into 11th. The car was particularly slow in two areas of the track and that is where the remainder of our teams focus to improve the car would be for the remainder of the weekend. Race 2 followed a few hours later and track and ambient temperature conditions were very similar so it would prove to be a good benchmark for some of the suspension changes that we would make to improve the car. As is the case in the Porsche PAYCE Carrera Cup Championship, the progressive grid race format means that where you finish the previous race is where you start the next one. The O’Brien Electrical and Plumbing Porsche would start the race in 11th. I made a reasonable start, but dropped a spot on the first lap. I did manage to move forwards a couple of positions to eventually finish 10th. It was a fairly processional race with not a lot of overtaking and the changes that we had made to the suspension of the car in order to improve it, really had no impact on our relative competitiveness. Still there was more work to do in order to understand what we were dealing with. We also had to be mindful that this weekend was the first weekend of the year where we were not fixing the car from damage caused by others, so it was a bit of a reset for us. Almost the first proper race weekend. So that was Saturday complete and the first night O’Brien Racing had left the circuit during a race weekend in 2019 at normal time due to not having to fix a damaged car. No Pizza or takeaway food tonight!!! With only one race scheduled for Sunday, the morning was spent studying the performance data and discussing with Kevin, Luke and Rohan what changes we could make to see a performance gain. It was clear where our performance was deficient, but making it better was the challenge. We decided on some sensible changes and headed to the grid with some confidence that we made some good positive gains. I made a cracker of a start and moved straight into 9th place and the car was undoubtedly more competitive. We were now battling with the next group that encompassed up to 6th position. We got some good gains and were battling hard for places and by the end of the race found ourselves in 8th place. Progress. The next round we head off to Darwin in June. Lots of data to pour over and maybe another test day. Onwards and upwards.